Hello snarky friends! 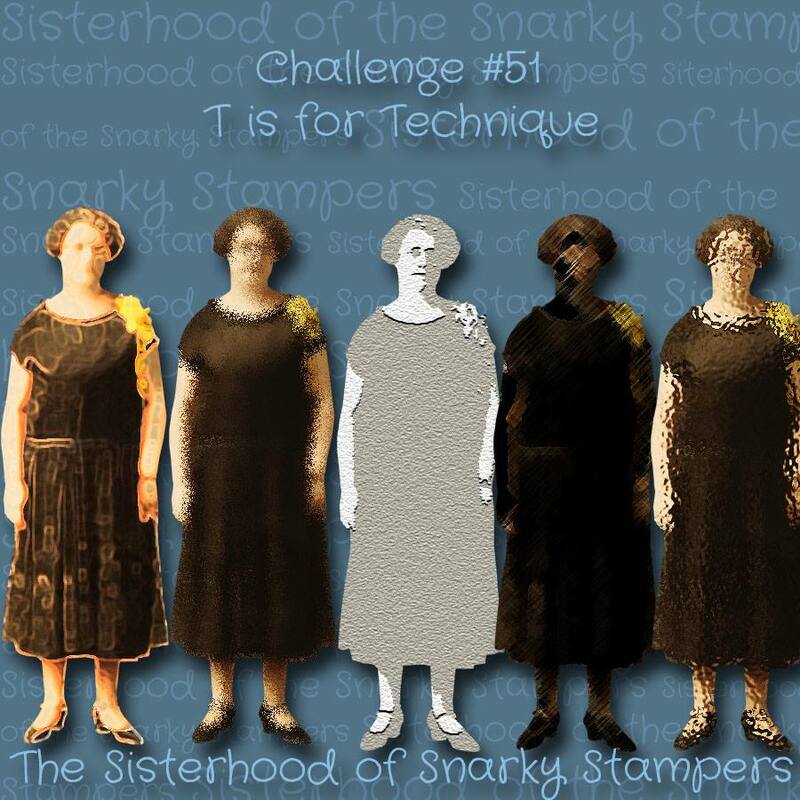 Thanks for stopping by to check out the newest challenge from THE SISTERHOOD OF SNARKY STAMPERS. This week Edna and the sisters want you to put on your thinking caps and show us a technique, maybe it's something you've never tried before, maybe it's your go to...whatever it is, we want to see it AND we want you to tell us what it is. I used a few different techniques for my card(s) this time around. I created my own background, which I like to call Grandma's wallpaper - when my parents moved into their new home in 1989 the living room and hallway had this most awesome blue velvet damask wallpaper, it was the most amazing thing I had ever seen!! The old pot & pan (my dad) tore it off almost immediately...but even now damask reminds me of that funky wallpaper! 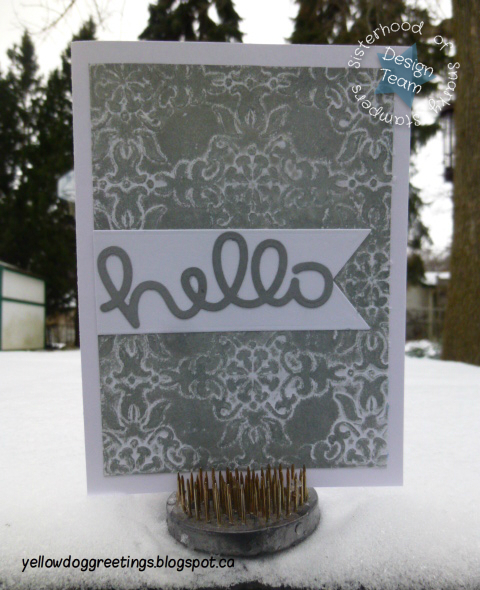 First I embossed the piece of cardstock with the damask embossing folder, then I brayered ink over top. Then to make it look worn / distressed, I sanded the bejeeeeezuz out of it. I also inked up another piece of white cardstock in coordinating ink to cut out the word so it would be all matchy matchy. Then, thanks to my ever-so-smart-friend-Betty I ran the hello through my Xyron sticker maker...ha ha ha I will never have to worry about gluing fiddly words again! Thanks for that tip Betty!! I was so impressed with my grandma's wallpaper background that I made another one. Please visit the SISTERHOOD OF SNARKY STAMPERS BLOG for all the details on the challenge and while you are there show some crafty lovin' to my snarky sisters and our Guest Designer Maarit. They are so beautiful Donna, very tactile. Enjoy the weekend sweetie! All that work and the post disappeared. Awesome techniques both cards are fabulous. the Zyron idea is a good one. I have one of those too, must look to see where the girls put it when decluttering my room. I think I should have been there too but three people in a 10X12 room with all my "stuff" wouldn't have worked. I love it in both colours! One does not get to use bejeeeeezuz in a sentence nearly enough ... love your awesome technique (I always had a fondness for that velvet wallpaper as well). My mother thought flocked, velvety wallpaper was the best thing ever. :D And yes, these backgrounds do remind me of just that! These are beautiful, Donna — and a great technique! YES! YES! And YES! 1. This is a fantastic technique and I am going to try it! 2. You rocked it with the Matchy, Matchy, and 3.the XYRON sticker machine is soooo fantastic that I now own it THREE sizes! 1.5 inches, 2.5 inches and 5 inches!!! Great job... love my mini xyron... I probably would have ripped it down right away too. Love that grandma's wallpaper background! Yes, everyone has been raging about die cuts and Xyrons lately. Why wasn't that obvious to us from the get go?! LOVE the Grandma's wallpaper technique! Your cards look gorgeous! I like your Grandma's wallpaper. Fabulous!